LG and Sony confirm no curved TVs for 2017 | What Hi-Fi? It came as no real surprise when LG and Sony revealed they were both killing off 3D at CES 2017. The feature failed to take off for a number of reasons, not least cost and the competing passive/active technologies. Now, both LG and Sony have confirmed that there won't be any curved TV options on the menu this year either. Speaking at the company's InnoFest event in Crete, LG cited a lack of consumer interest as the key reason, with its research showing consumers tend to choose flat over curved when given the choice of similarly-priced sets. Sony had a similar event to outline its ranges for 2017 and curved sets were also absent - "there were no curved models in the line-up we showed at the trade show recently, but we are not commenting on our future plans," said a Sony spokesperson. We've always been open-minded about the curve and in fact gave LG's curved OLED55C6V an Award just last year. 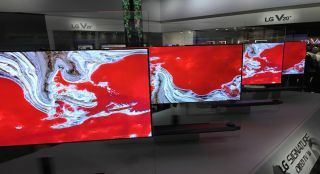 The good news is if you're in the market for a curved TV you might be able to track down some great TV deals on last year's models before the class of 2017 go on sale. Just recently we've seen a petition to bring back 3D TVs - could we see the same for the curve or has it been well and truly flattened?